Don't ever dare to try the vengeance of God, for His vengeance no man can withstand when God do avenge His people surely no enemy shall like it. When God avenge for His righteousness in the first man, he destroys the relation of the human race by the curse. When God made to avenge for his Glory that was not meet by his creation to give him glory, he destroys the creation by a flood of dreadful waters save Noah and his believing family. When God avenge for Israel, He destroys the lives of Egypt. When God avenge for His leader Moses, He made to kill the company making fools Hebrews be swallowed up by an open earth in the wilderness. When God avenge His people, he is a just to destroy the enemy by his power and no man can able to stop Him! To all the enemies of the Biafrans, my challenge is, have you consider who is Biafra, whom you are fighting for and want to enslave and be cut off in the promise land? GOD is NOT A JOKE !!! BIAFRANS are sheep so harmless, but their strength is their shepherd. God's rod of iron and the stuff are their comforts in the restless night of great oppression and even death. Don't forget that God can give Biafra comfort even through the floods or fires of much affliction they will more praising God for they Biafrans knows the heart of their shepherd and they follows God faithfully even to death they are Biafrans and cannot be Nigerians. Finally, God, this time had reach to his point of vengeance for the blood and lives of his people the Hebrews in Africa residing in a paradise of promise called Biafra the Zion land or the hills of Zion none other than Biafra was the appointed dwelling of the Ashramites and the Gaddadites Israel the tribe among black Hebrews. Biafrans are in this last days the fulfilment of a very famous and oldest Abrahamic prophecy by Israel to his son Gad the 7th of the 12 tribes children of Jacob whom God called a name Israel. 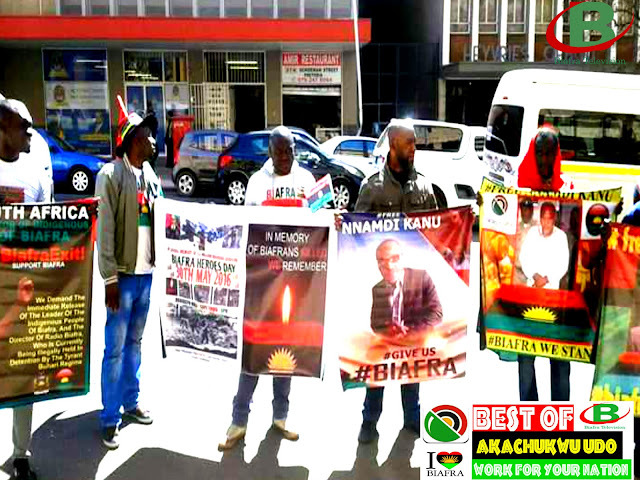 Biafra is a prophesied Nation and the oldest in the history of whole Africa. When we consider the wide range of Egypt that time after Joseph had made it prosper and make famous Nation through God's blessing to him was over poured to Egypt for the old pharaoh was kind to Joseph, so God also bless the whole Nation Egypt, nd it reached its glory even to the land of the Niger Delta called Niger area 1,000 years before the making of the great Pyramids of Egypt was already the Niger area had its existing Pyramid in twin of old. God has promised Abraham, that wherever your sole of your foot treads upon, it shall be to you a nation.Your children shall be as many as the stars of heavens, now focus the clause "stars of heaven mean scattered universally) Mean Israel's horizon as God has prospered them in a promise now rising a Nation legitimately from God and for God- His Biafra. And part of God's promise is a warning to enemies when God said "I WILL BLESS THEM THAT WILL BLESS THEE, AND CURSETH THEM THAT WILL CURSE THEE. So by the Power of God's word for the children of Israel living in Africa-Biafra was God also now Avenge them from the cruel Zoo Nigeria which by the power of God's mighty hands it fallen like a hungry and dehydrated serpent can't anymore stand after god's first and final plague was taken. And Nigeria collapsed and won't and can't anymore recover. It is due to the zoo touching God's elects and was not aware who they are but rather makes them slaves much affliction like some to first Egypt, but God did n't survive prolong, and He judge the zoo like no other torment even the doom of the great Nigeria now becomes lesser than a grassland of nothingness.Nigeria several times provoked God's vengeance to AVENGE BIAFRA, so now God is moving towards his people, so NIGERIA now utterly FALL.